P.Taylor is a lecturer in agricultural education and training in the Agricultural Extension and Agricultural Development Department of the University of Reading, United Kingdom. He is currently working as an education adviser within a Social Foresty Support Programme in Viet Nam. At the heart of most development programmes, whether they are oriented towards agriculture, health, nutrition or finance, is an attempt to bring about change in people. In educational terms, change may come about in people's knowledge, understanding, skills, attitudes and behaviour. The change should result in a person having an increased capacity to make decisions and to choose, implement and evaluate strategies effectively utilizing their available resources. The need for personal development in individuals would rarely be disputed. However, exactly who should identify the need for change and how they should do so, as well as the way in which educational programmes should subsequently be planned, implemented and evaluated are often the sources of debate. In order to provide educational programmes in an institutional context, some sort of basic structure is required and the underlying framework of this structure is the curriculum. Great efforts are expended regularly on an activity known as curriculum development, by schools, colleges, universities and training providers of different kinds. For all this effort, a recent study of agricultural education and training in sub-Saharan Africa (Wallace, Mulhall and Taylor, 1996) suggests that many agricultural education curricula have shortcomings. The study found that many curricula are unresponsive to socio-economic and technological changes in the rural sector and are inappropriate for the local context. Furthermore, many curricula do not involve any form of systematic training needs analysis and often adopt delivery modes and mechanisms that fail to suit the reality of the situation of people working in rural areas. It is likely that this situation extends beyond the sub-Saharan Africa region to many countries throughout the world. Perhaps one of the greatest problems facing agricultural training institutions is that the curricula they use are rigid and inflexible, not only in structure and content, but in the way in which they are developed. A curriculum should be a dynamic instrument that reflects the educational objectives that are to be attained and the educational experiences that can be provided to achieve them. Since these objectives will change over time, so will people's judgements as to what experiences will be likely to achieve them. There is therefore a need for continual curriculum reform as society itself develops. Where curriculum development is a fundamental aspect of a rural development programme, there is a need also to reflect changing perspectives on the nature of sustainable agricultural production. A rather paradoxical situation arises where curriculum development is influenced by global perspectives on education and training, requiring the inclusion of thinking on key societal, economic and environmental issues. At the same time, there is a need to include relevant local content that has direct application to a particular context. An approach, termed participatory curriculum development (PCD), is emerging and it may help to achieve a balance between the demands of both global and local contexts. 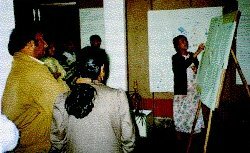 Most people working in rural development are familiar with the concepts of participation and participatory approaches. The link between participation and the effectiveness of learning continues to be emphasized (Pretty et al., 1995). Learning can help rural people to analyse, plan, take action, monitor and evaluate a range of issues and activities (Chambers, 1997). Today, particularly with the increasing interest in experiential and learner-centred education, learners are encouraged to take responsibility for their own learning. At the same time, there has been some recognition that teachers and trainers should have an input into what they teach, as well as how they teach it. Curriculum development, however, still tends to remain the responsibility of a few, an elite group located at the top of a hierarchy. The idea of other stakeholders having a clearly identified role in curriculum development is uncommon. PCD seeks to identify all of the stakeholders who may contribute to the ultimate aim of education - learning. Dialogue and interaction are needed to reach an understanding of stakeholders' various interests in the curriculum development process. In addition, there is a need for a mechanism that defines the role of stakeholders within the curriculum development process and allows them to fulfill this role. Some stakeholders will be "insiders" who have an intimate knowledge of the educational system, such as teachers, learners and materials producers. Others may be "outsiders", for example farmers, extension workers, employers, policy-makers, educational experts and funders. All will have some role to play in the PCD process. PCD is not a hierarchical, top-down approach. Many of the institutional structures that are responsible for curriculum development are hierarchical and expert-centred (Figure 1). At best, some stakeholders are consulted in a hierarchical model of curriculum development, but this may simply be a gesture of inclusion. It is likely to be assumed that experts will make the best judgment about what should be learned by the learners. Speed, logistical ease and economy are usually cited as justifications for experts and policy-makers controlling the process. PCD is not content-oriented. A hierarchical approach is likely to result in the content being the basis of curriculum development. Policy-makers and subject matter specialists, for example, choose topics and subjects that they feel are necessary and desirable in order to achieve predetermined outcomes. A training needs analysis may be carried out but, in the end, the decision on the curriculum content and the objectives rests with the group of experts. Schamhart and van den Bor (1994) describe this as "rational curriculum development". PCD is not exclusive. A participatory approach to curriculum development seeks to include stakeholders rather than exclude them. Hierarchical approaches, by nature, ensure that certain groups maintain control of the curriculum development process. Those who are low in the hierarchy will probably have very little input in the curriculum and become disinterested and demotivated as a result. In PCD, any group or individual with an interest in a particular educational process or product (whether this interest is general or specific, supportive or hostile, overt or covert, whole- or half-hearted) is eligible for involvement. Even those who seek to undermine a programme may become involved in the programme. Those who are normally marginalized for whatever reason have the opportunity to devise a role for themselves. PCD calls for radical changes to the hierarchical curriculum development approach (Rogers and Taylor, forthcoming). The aim is to develop a curriculum from the exchange of experiences and information between the various stakeholders in the education and training programme. PCD seeks to identify all the stakeholders, including educators, researchers, policy-makers, extensionists and farmers. It seeks to involve them in the construction of the curriculum - the full curriculum, not just in the subject matter being taught but also the experiences and activities that the learners will engage in during the course. PCD seeks to explore with the stakeholders, collectively or individually, their views about the desired learning objectives and the processes necessary to achieve those objectives. Rather than involving only a small select group of experts, the process of curriculum development now involves as many stakeholders as possible. Most importantly, the top-down structure disappears. The curriculum developers may be in the centre of the process, but they are now free to draw upon the experience and insights of all the other stakeholders, including the learners (Figure 2). A PCD approach is more flexible, accommodating the demands, needs and expectations of stakeholders. This does not mean that PCD is unsystematic. It still attaches due importance to a structured means of planning, implementation and evaluation, involving different stakeholders in appropriate ways in each activity. In a number of countries, a desire for change in the curriculum development process for agricultural education and training has been expressed. Teachers and trainers seek new ways of developing education and training programmes that do not simply refer to community involvement, but are actually based upon it. Extension and rural development programmes in these countries are successfully utilizing participatory approaches, and benefits are being realized by farmers and rural community members. While these positive developments are taking place in extension and rural development, the education and training components of the same programmes are sometimes still confined within a traditional hierarchy. The author has worked recently in two countries, Viet Nam and South Africa, which are undergoing considerable social and economic change. This change is affecting agricultural education and training policies and programmes at both national and local levels. As part of a social forestry programme in Viet Nam, support has been provided to a forestry college for the development of social forestry training programmes in a technically oriented institution. Different levels of training are provided at the college, ranging from undergraduate courses to field-based courses for farmers and forestry extension staff. Traditionally, curriculum development in Viet Nam has been very hierarchical. At present, the college staff who are involved in the curriculum development process have links with other universities and a small number are involved in external, field-based projects. However, the links between the college and the field are rather limited and disjointed. The vertical linkages between the college and senior government officials who create and provide the policy framework within which the college operates are much stronger. Until recently, college staff have had little direct contact with extension workers and farmers. At the forestry college, it is being recognized that any new curricula being developed should be based upon a comprehensive national training needs analysis. College staff are proving to be willing to use extension and research activities to provide knowledge and experiences for curricula. However, what is lacking is a mechanism by which different "outsider" stakeholders can be involved in curriculum development other than simply being consulted in a training needs analysis. During a recent workshop, a stakeholder analysis was conducted with college staff as a preliminary step in establishing a PCD process. This experience was very informative, as participants were asked to identify all the stakeholders in the curriculum development process and then to assign relative levels of importance and influence to them. The tendency was for participants to place policy-makers before other stakeholders. It was interesting to note that farmers, the ultimate beneficiaries, were consistently omitted from lists of the stakeholders who would have an interest in short course development for field-level forestry extension workers. When the omission of the farmers was recognized, they were rapidly added to the list and assigned a high level of importance. The workshop participants acknowledged that the farmers had been "forgotten" during their discussions, reflecting the relatively low priority that farmers frequently receive from many teachers and trainers. The farmers' role in the development of education and training programmes is increasingly important because farmers will gain a direct benefit, which is realized either through receiving training themselves or through working with field-level extension staff who have received training. As curriculum development continues in the forestry college, there are signs that a broader range of stakeholders, including farmers, will become involved in the process to a greater extent than before. The establishment of a national network of forestry-related training institutions, each of which has its own local network, is proving to be an important outcome of the PCD approach. Curriculum development is an important element of another programme involving a key rural development institution in South Africa. Within the programme, a series of curriculum development workshops have been organized for a group of participants from both government and non-governmental organizations (NGOs) whose interests include health, community finance, agriculture, forestry and water management. Beginning with a stakeholder analysis by the participants in their respective organizational groups, strategies for identifying training needs were drawn up. Central to these strategies is the need for meaningful involvement of stakeholders which must continue beyond the training needs assessment into the planning, implementation and evaluation stages. Following an initial workshop, participants were visited in the field to ascertain how successful they had been in implementing the strategies they had developed. The results were impressive. On the strength of their stakeholder analysis, a group of trainers who manage a training farm organized a meeting for aspiring poultry farmers from the local community. A range of other stakeholders were invited to the meeting, including representatives from the local government extension service, credit providers, feed suppliers, large-scale commercial poultry producers and various NGOs from the region. A much larger group of interested community members attended than was expected. A free and frank exchange of views took place between aspiring poultry producers and the credit and input providers, which would have been unthinkable under the former political system. By the end of the meeting, several representatives of the local farming community had been elected to establish a network throughout the entire province. This network now liaises with existing commercial enterprises and organizations to facilitate credit provision, input supply and the establishment of new production units. The network also communicates regularly with the training farm, enabling the trainers to set up appropriate skill-based training courses on essential topics, including poultry husbandry, health and business management. A secondary development is the creation of a steering group made up jointly of local farmers and trainers, who have a direct input into strategic planning for the training farm. In these ways, the PCD approach has been utilized effectively to ensure that trainers act in full agreement with local community members when developing new curricula. This process is continuing and will soon include other areas of training. Although resources are still limited throughout South Africa, and public demands and expectations of the government are high, this example demonstrates that newly emerging rural groups are starting to interact with key resource providers with whom they had no contact previously. People who were formerly dispossessed and disempowered are gaining access to education and training, information, facilities and resources related to agricultural and rural development that will help them to establish their own rural enterprises. Farmers and rural community members are helping to guide the direction of new agricultural education and training programmes from which they can derive benefits to pursue their own goals for economic development and progress. From the above, and other experiences with the PCD approach in the field, a number of opportunities and constraints have been identified. These are summarized in the Table below. Any agricultural education and training programme is set within a particular social context which is constantly changing. It is therefore important to ensure that the context can influence the development of the curriculum. This means that the list of stakeholders is not fixed and unchanging. Although it may be assumed that all the stakeholders have been identified during the PCD process, there is always the possibility that some have been omitted, that some may emerge later or that changes in society will create new stakeholders with an interest in a programme. The possibility for new stakeholders to become involved at any stage in the process should be created, so that they can be drawn in as a programme evolves. As different groups and individuals are drawn into the curriculum development process, it is important to appreciate that many differences may exist between stakeholders. Differences have been very apparent in some field situations, especially where major political changes have recently taken place. Some stakeholders may feel resentful towards others, whereas other groups of stakeholders may develop strong, supportive bonds. Some stakeholders will be concerned about the upholding of "standards", whereas others will be concerned simply about gaining access to training. Financial, physical and human resources may be limited, creating barriers to the effective involvement of some stakeholders. These challenges are real and natural and should be accepted and addressed, rather than hidden or ignored. Facilitation of the PCD process by thoroughly trained and committed persons is critical to enable groups to feel comfortable enough to communicate openly and frankly about their needs and to explore ways in which they can move towards meeting them. It has become apparent from experience in the field, that PCD requires resources (both human and material), sensitivity, commitment and, crucially, time. PCD cannot be rushed, but once a PCD approach has been adopted and the process has begun, the possibilities for continued and long-term successful training outcomes are increased. In many countries, farmers in particular have had little or no say in the development of training programmes that affect them directly. PCD presents an opportunity for this imbalance to be rectified. Such possibilities for involvement may provide real incentives to anyone who is genuinely committed to participation in curriculum development within agricultural education and training programmes. Chambers, R. 1997. Whose reality counts? London, Intermediate Technology Publications. Pretty, J., Guijt, I., Thompson, J. & Scoones, I. 1995. Participatory learning and action. A trainer's guide. London, International Institute for Environment and Development. Rogers, A. & Taylor, P. (forthcoming) A guide to participatory curriculum development. Rome, FAO. Schamhart & van den Bor, W. 1994. Curriculum development in higher agricultural education. A case from Benin. Higher Education Policy, March. Taylor, P. 1997. Participatory curriculum development for agricultural extension training. Paper presented at the 13th European Seminar on Extension Education, Dublin, 1-7 September 1997. Wallace, I., Mulhall, A. & Taylor, P. 1996. Developing a Research Framework for Improved Policies for Agricultural Education and Training in sub-Saharan Africa. Report of an International Consultation held at Reading, UK, 20-21 March 1996. Reading, UK, Agricultural Extension and Rural Development Department, University of Reading.